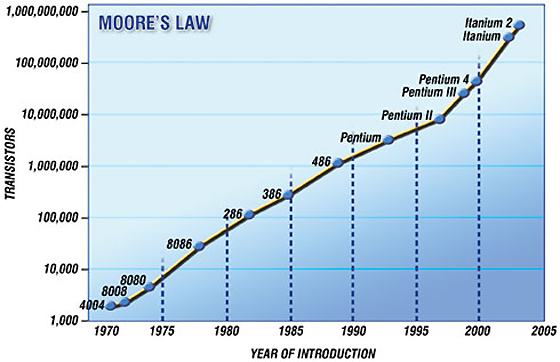 Moore's Law was first introduced by Gordon E. Moore in 1965 which states an observation that the number of transistors on an Intergrated Circuit doubles every two years. Therefore, we could expect anything that relates to semicoductor technology, such as memory devices, digital imaging, storage devices and all electronic gadgets will be more twice as powerful in terms of processing power as they are now in two years time. Other advantages such as smaller size, lighter in weight, higher flexibility, more pixels and better power management are expected to come in tow. 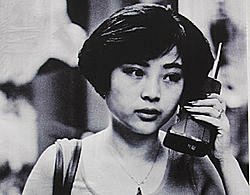 Moore's Law serves as a prediction and a roadmap for researches and businesses that are involved in semiconductor technology that encompasses many items such as the computer, mobile phones and many other miscellaneous electronic gadgets that we use in our daily lives. Therefore, as long as research work and funding are given for creating, designing and investigating new methods and materials to improve and enhance this industry, we will continue to grow as a civilization. We've seen the transistor shrink in size from a large vacuum tube into tiny micro-sized transistors that are not possible to see with the naked eyes. Now they're already moved into the nano-regions and it does not stop there. Recently, physicists have announced that they are working on a single-atom transistor that might open to a possibility of enormous computing capabilities. So, when do we stop? Do we go even further into the single-atom transistor? Does Moore's Law have a limit? What comes after we've exhausted all the possible materials? I think all the answer to those questions lies with us, on whether we want to pursue a deeper knowledge in this subject and also if anyone cares enough to provide funding for the research.